We’re going old school today. And by old school I mean back to late 2013 when I posted one of my first ever recipes here on Spoons – the one that really got me interested in recipe development and made me start wanting to take this whole food blogging thing a lot more seriously. I mean, I dabbled with a few recipes prior to that (check out these cookie dough protein balls from 2011!! ), but then I stopped blogging, then I came back, then I was writing about different things… yada, yada, yada. 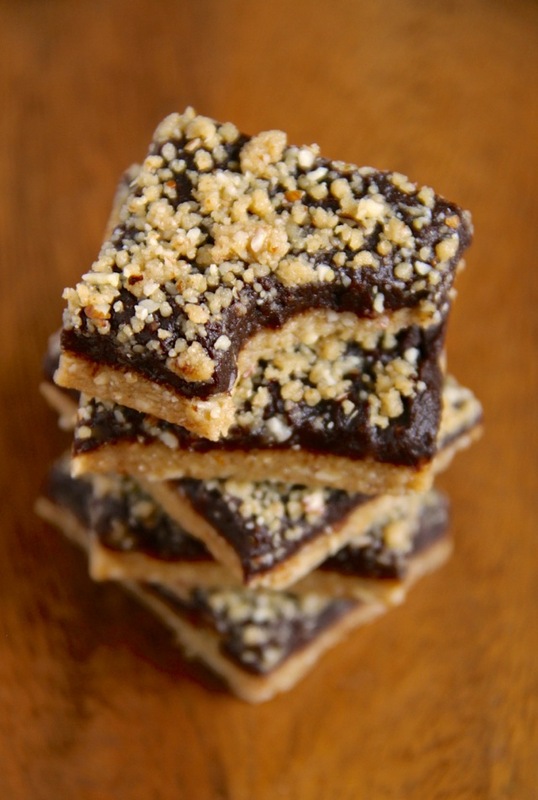 Long story short, it was these no bake almond fudge protein bars that set the stage for what Spoons would eventually go on to become, and I wanted to revisit them today because I’m feeling a bit nostalgic. Well, that and I just reshot the pictures and felt inspired to write about them after eating one for the first time in god knows how long and having my socks rocked right off. Don’t mind me while I toot my own horn. Toot, toot. In all seriousness, though, I really did want to shine a little light on these bars because, while I was originally just going to reshoot the pictures and update the old post, Spoons has grown so much since then and I’m betting a lot of people didn’t even know these gems existed… which is basically a crime against humanity. Toot, toot. And I’ll stop with the tooting because that word makes me think of one thing and one thing only… and that’s not exactly the image I want to conjure while trying to entice you with a delicious recipe. I’m actually half tempted to edit that whole thing out, but that’s the way my mind works so we’re just going to roll with it because – #authenticblogging. 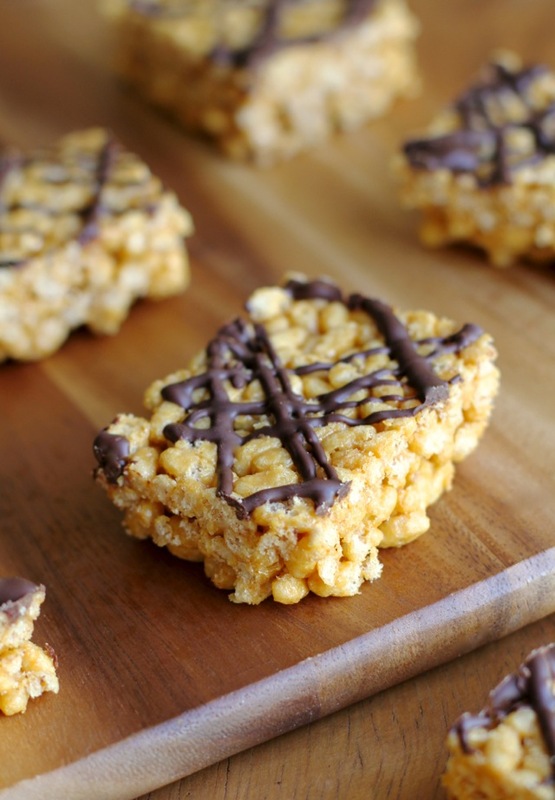 Just like they were all those years ago, these bars are soft, dense, and fudgy with a subtle crunch thanks to a sprinkling of crispy rice cereal. They basically melt in your mouth while still giving you something to chew on. They’re also made with wholesome ingredients like oats, almond butter, and brown rice syrup, making them worlds better than most of the chemical-filled bars that you buy in stores. And they’re cheaper, too! Last time I checked, most store-bought protein bars were running about $3-4 a pop, which is just… no. 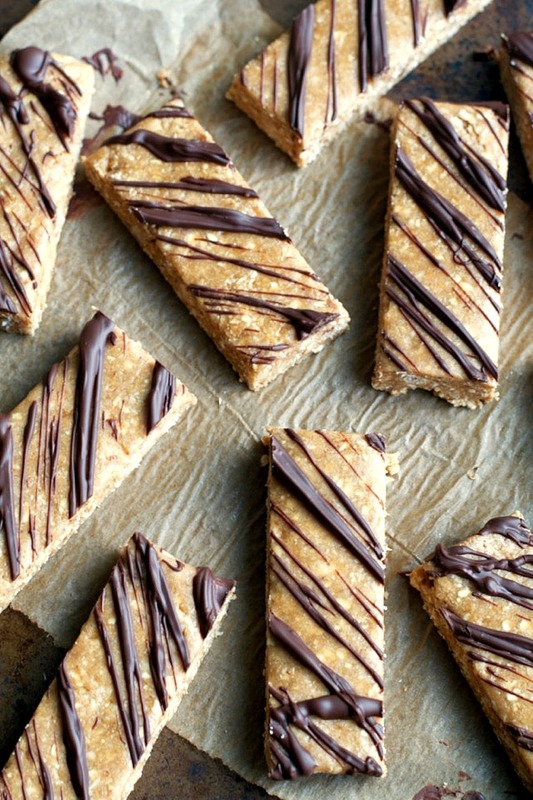 These homemade bars, on the other hand? So.much.yes. I kept the recipe mostly the same, but also tested a vegan version by subbing the honey with brown rice syrup and the whey protein with brown rice protein. Both came out perfectly – you honestly can’t even tell the difference so it really depends on your dietary preferences and what kind of ingredients you have on hand. And that’s about it! I hope you didn’t mind taking a trip down memory lane with me, and I hope you enjoy these awesome bars! Prepare an 8x8 (20cm x 20cm) baking pan by lining it with a sheet of aluminum foil or parchment paper, leaving a few inches of overhang on the sides to allow for easy removal. Set aside. Combine the oat flour, quick oats, protein powder, and crispy rice cereal in a large mixing bowl, stirring until well combined. Pour the wet ingredients into the dry ingredients and mix until fully incorporated. The mix might seem a little dry and tough to work with at first, but continue mixing until the ingredients start to incorporate, adding 1-2 Tbsp (15-30 ml) of almond milk to soften it up, if needed. 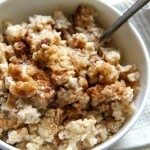 Transfer the mixture to your prepared pan and use a spatula to distribute it evenly, making sure to press down firmly. Place the chocolate into a microwave safe bowl and nuke on high in 20 second intervals, mixing between each round. When the chocolate is fully melted, drizzle it over the top of the packed mix using a spoon. Cover the pan with a sheet of foil and place it into the fridge to set, at least 2 hours. When the bars have set, remove them from the pan using the foil overhang, and use a sharp knife to cut them into individual bars. Store them in the fridge or freezer for best results. ** I like to use almond butter since it has a sweet and mild taste, but feel free to sub this out with any nut butter you like, or use a seed butter to make it nut-free. The only thing I suggest is to use a store-bought no-stir variety, since the oils in the natural butter could alter the texture of the bars. *** To make the oat flour yourself, simply run your oats through a coffee grinder or blender until they're the consistency of a fine powder. 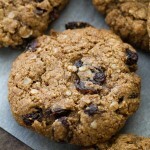 Or you can use 3/4 cup (80 g) of pre-ground oat flour. 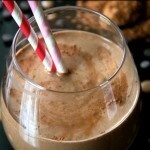 **** I used a rice protein powder, but you can sub this out with whichever protein powder you have on hand. Since different protein powders absorb liquid differently, you might have to adjust how much almond milk you add. ***** Alternatively, you can melt the almond butter and honey on the stove in a small saucepan set over medium heat. 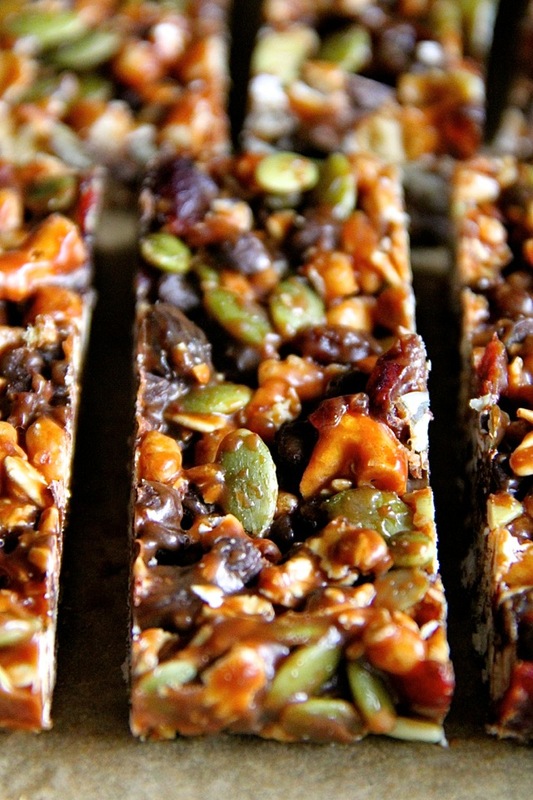 What are your favourite store-bought snack bars? These look so perfect Amanda! Love that you have an actual recipe moment that marked the beginning of your growth as a food blog. I still have many recipes to go back and either update pictures or rework them. My archives scare me! YUM! I’m about to dive into the land of updating old posts and I’m sure there will be a few gems I’ll have to bring back to the surface, so toot away, girl! 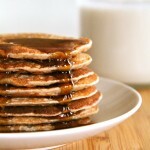 These look soooo pretty – not to mention delicious! I’m liking the authentic blogging and I find myself doing the same thing… I reread a sentence and think really, Erin?? But 99% of the time I keep it in because that is my brain and my stream of thought 😀 Love these bars and I’m glad you brought them back! They deserve it. last snack I had was an apple with peanut butter, you know, the usual. 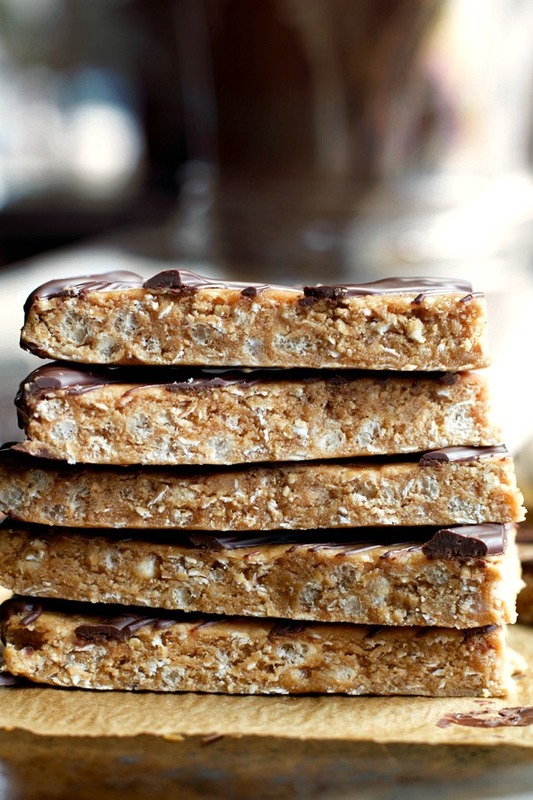 I should make these bars with peanut butter, I just need more honey in the house! I only have that dinky honey bear and it’s so annoying for squeezing out large quantities. Aww yeah. I get mine in jars since I go through so much. I do miss the honey bears though! Whoa. These beauties look amazing! The last snack I ate was an orange. And I’m preparing to eat a bagel as a snack or breakfast #2 as I’m calling it these days! I remember these bars!! I actualy have them saved in my “need to make” file, but always forget to buy the dang rice cereal at the store! Maybe I can just sub in some more whole oats? I’ve done that before! And it works, but the extra crunch is definitely nice to have! You just had to go Toot, toot didn’t ya?! It’s like you know I’m pregnant and have no control over those things anymore. Hey, I blame you for this revelation today. If you had kept it clean, I wouldn’t have overshared. Aww, who am I kidding? I would have overshared anyway. I love tacking old recipes out for a new spin. Sometimes, I think we’re so recipe driven, we forget about all the fantastic things we’ve made in the past. I love that you’ve revisited an old favorite. These bars sound great, Amanda! 🙂 Break me off a piece! I don’t buy snack bars for myself because they’re just so expensive! But Callum likes to chow down on a Lara bar every once in a while. These look great, Amanda! Ugh…I have so many recipes that need updating. It really stresses me out when I look at my recipe index. I’m all about making my own granola bars. LOVE these! Glad you decided to bring this yummy recipe out for everyone to see again, it’s pretty awesome. I just can’t believe people spend that much on protein bars in the grocery store, it’s crazy! Homemade for me, and these look perfect! Oh my goodness! I’ve been looking for a bar recipe and these look awesome. Thanks for sharing…do you have any other protein bar recipes? I remember these!!! They ARE so good! I love that you ‘tooted your own horn’! I mean, when you have something this good, it’s a shame not to share it! These look so good! How fun to revisit old posts! Taking trips down memory lane and delicious ones at that – if this isn’t a positive aspect of re-calculating ingredients for all of your recipes :)! I’m almost embarrassed to say I likely remember every single one of your recipes because I’ve been following you forever already. I jumped over here today from a comment you left elsewhere and reading the title [CommentLuv] immediately thought “didn’t she post a recipe called this name before. ..?” Either way, good idea to bring these back. They still sound just as good. I’m glad you decided to leave the tooting part in, lol! All jokes aside, you deserve to toot your own horn because these bars look freaking amazing! I’m drooling like a fool over how good you made them look in these pictures. WANT! The last snack i ate was peanut butter and apples and my favorite store bought bars are larabars! 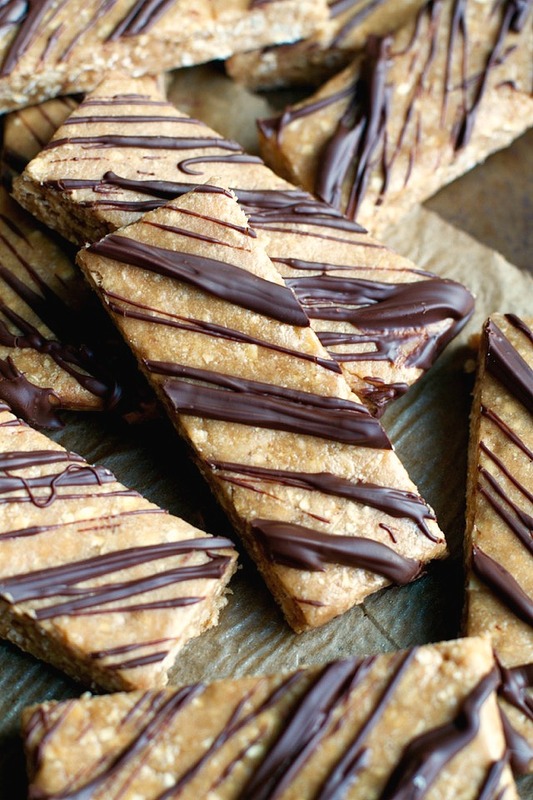 you have the perfect chocolate drizzle on those bars! so impressive! I hope so for how much stress it causes me while I’m doing it 😆 I swear that baking is so much more stressful when you know you’re going to have to photograph the finished product. The last snack I ate was a bunch of sweet pickles =P My favorite bar is probably ClifBars. The trail mix or seed ones are my favorite. Beautiful pictures Amanda! Yumooo! These are beautiful. I also love the new blog look. Not sure when you made the swap, and I may be late to the party, but it’s a subtle change and it’s lovely! Thanks lady! It happened just a week ago. Spoons had some serious technical issues so I decided to just freshen everything up. 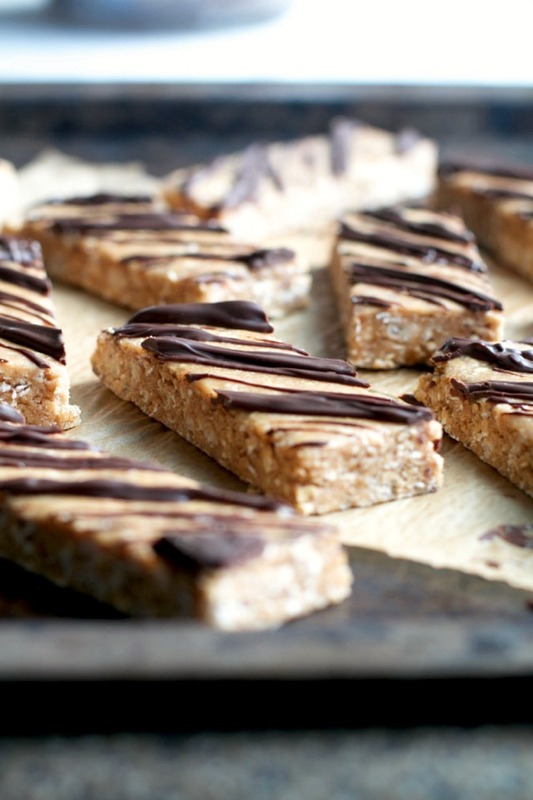 I’d never thought I’d say that my mouth is watering looking at a protein bar but… it’s true!! These look amazing! Drool! I need these now! They sound amazing! And your chocolate drizzle could not be more perfect!! Pinning! 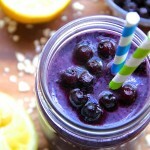 Thanks Amanda….yammi and healthy recipe…I will try your recipe at home….can i use coconut milk instead of almond milk..would it be tasty too? Almond fudge is just amazing and I just learned about how to change font size in windows 10 in a short span of time.